This week's AUTOSPORT magazine is an unmissable one for tin-top fans, as our British Touring Car Championship correspondent Kevin Turner has been slaving over a hot keyboard to produce our series review supplement. In it, he looks into the major stories of a controversial season that included eight different winners from seven different teams and ended in title glory for Matt Neal and Honda after a five-way showdown at Silverstone. Indian GP report - The racing action at Buddh was a bit korma on the spiciness scale, but as ever there was a whole palette of factors in the background, which are unravelled by Mark Hughes in his report. The report is accompanied by technical news, results, qualifying, Hughes' ambient 'Trackside View' column and Edd Straw's driver ratings for the weekend – which are rather disconcerting reading if you're Brazilian and you've been around for yonks. Mark Hughes column - Our grand prix editor also contributes his regular MPH column. This week he wonders whether the very existence of the Indian GP is something we could feel comfortable with. F2 Barcelona - Stepping down from F1 to F2, Barcelona hosted the final round last weekend. Mirko Bortolotti was already champion but that didn't stop him winning a double, watched by Sam Tremayne. Race of my life - It's a 'gold' edition this week with the late Cliff Allison, in which he tells of his performance at the 1958 German Grand Prix, which would prove to be a turning point in his career. 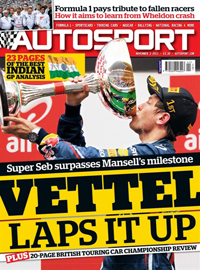 Read this week's AUTOSPORT digital magazine. Can this man really beat Loeb? Where next for Nick Heidfeld?